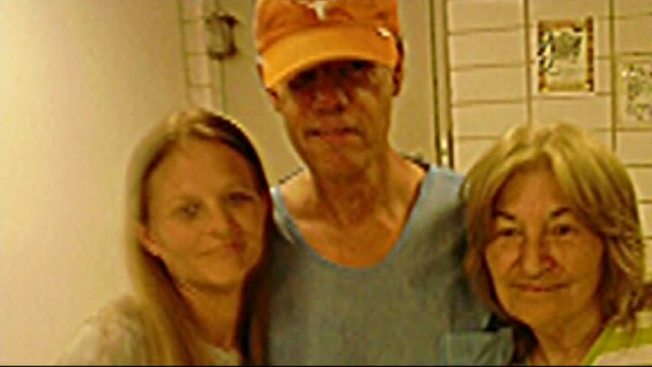 After a bizarre series of events that ended with a night behind bars, country superstar Randy Travis still found the time to mug for the camera with fans at the Grayson County Jail. Travis ended up in the county lockup after police said he threatened the lives of the Texas State Troopers who arrested him on suspicion of DWI following a car crash that allegedly left him lying naked in a roadway. Prior to that incident, a North Texas store owner said Travis strolled into his convenience store, also naked, and tried to buy cigarettes. While the guest of the Grayson County Sheriff's Department, Travis was apparently presented with a pair of scrubs to clothe himself. Before posting bond and departing late Wednesday morning, Travis met a few fans who were visiting someone at the jail. According to Cassie Kearns, Travis spent several minutes chatting with her, and her mother-in-law Brenda Fontenot, and even explained what led to his detention before taking a photo with the pair. "I was hysterical -- I was so excited, telling everybody, 'I just saw Randy Travis,' but they didn't believe me until they saw it on the news," Kearns told us. "He was still, I think, in shock," Kearns said. "He told us briefly that he was drinking and driving and naked on the side of the highway." "He looked very ashamed and upset," said Fontenot. "Ashamed of himself, I guess." Fontenot said Travis asked her and Kearns to help him walk outside of the jail to an awaiting vehicle, helping him to avoid our NBC 5 cameras. They obliged. "I said, 'we will protect you,' and walked out with him." Fontenot said. Before joining an entourage escorting Travis out of the building, the women gave him a UT Longhorns ball cap they hoped would help disguise him -- as seen in the exclusive NBC 5 video below.